Lend a Hand! — A.B.L.E. With the new year underway and a new semester about to start, we've been busy behind the scenes at A.B.L.E. There's a lot going on, from curriculum planning for our rehearsals, to planning our production calendar, fundraising for our new adult program, and planning community outreach and events. As a small organization (with a small budget), we rely on volunteer power to make A.B.L.E. 's programs a reality. Our in-class facilitators are the most visible of our volunteers, but did you know there are many other ways you can get involved with A.B.L.E.? On Sunday February 18th, we'll be joining over 80 other non-profits from around the city for the Chicago Volunteer Expo. The Chicago Volunteer Expo is a one-stop shop for Chicagoans looking for meaningful volunteer opportunities. There are so many ways to give back to your community in 2018. Find the one that’s right for you at the Chicago Volunteer Expo! Whether your passion is the environment, the arts, social justice, or anything else, there’s a volunteer opportunity waiting for you. All ages are welcome, and it's totally FREE to attend. We are seeking professionals to join our small, active board of directors. Trustees are intimately involved in the operations of the organization helping to ensure sustainable growth and a successful future. Especially interested in applicants with experience in Finance/Accounting, Human Resources, Education, Disability Advocacy, and Marketing. Minimum 2-year commitment. If you love crafting, thrifting, sewing, building, or playing, this is the committee for you! Working with A.B.L.E.’s teaching artists and artistic staff, this team of volunteers works to source or build costumes and props and sets for each production. This team of volunteers is responsible for hosting fundraising events, soliciting donations, seeking sponsorship opportunities, and assisting with grant applications. We hope to connect A.B.L.E. 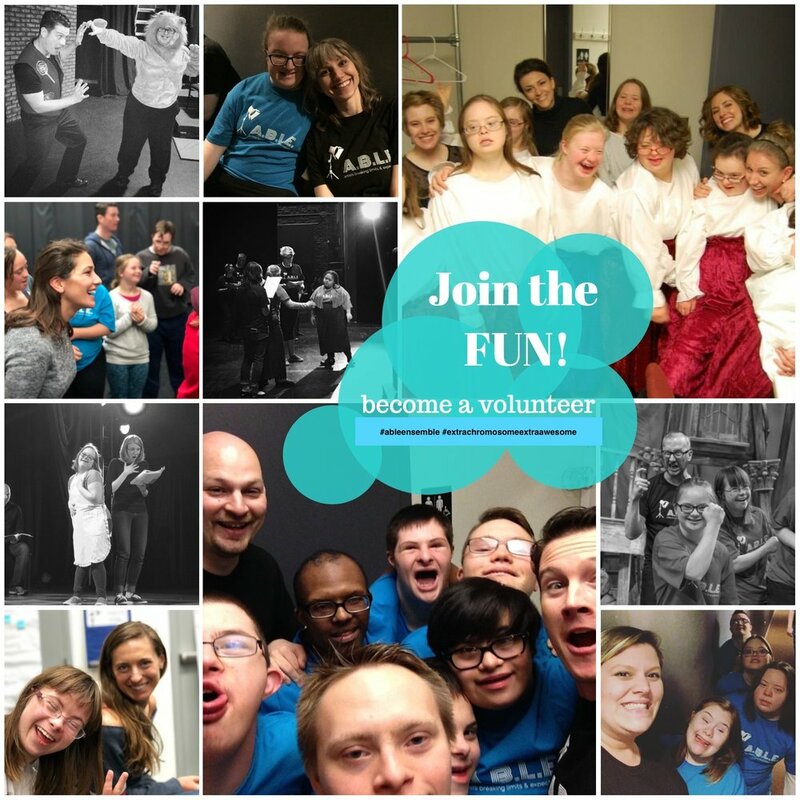 with the community at large, raise our organizational profile, and raise funds to continue building our program and keep it affordable for participants. A.B.L.E. produces two public performances each year. Each show is staffed by a front of house volunteers who work to take tickets, hand out programs, assist with seating, sell DVDs and promotional material, educate the audience about the program, and take donations. As a thank-you, you get a free ticket for some of the best seats in the house! Seeking individuals with a keen eye and visual art skills to develop our show posters, programs, social media posts, and other marketing materials. A.B.L.E.’s work is seen by a wide audience, so your designs could be hanging up all over town! Do you love photography or video? We are always in need of headshot photographers for our ensemble, event photography, and video of rehearsals/performances. Newer PostWho knows Cyrano? You know Cyrano!